1. Mix all dry ingredients together, then mix up the wet ingredients and add to the dry. 2. Grease two pudding bowls and fill ¾ full, then top off with baking parchment and tin foil, tie with string and put in a large pan on top of an upside down saucer. 3. Fill pan with water so it's around ¾ full, then cover and steam for 6 hours, topping up water as the puddings steam. 4. When cooked, remove carefully and cool slightly. Then, take the pudding tops off and add a splash of brandy or rum. Recover with fresh parchment and foil, then store until Christmas day. 5. 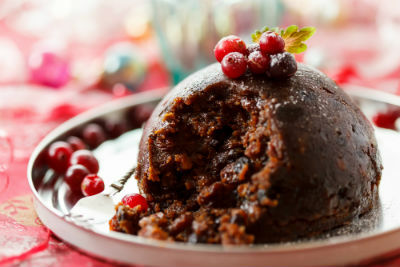 To reheat, steam for two hours and serve with your choice of custard, brandy butter or cream!